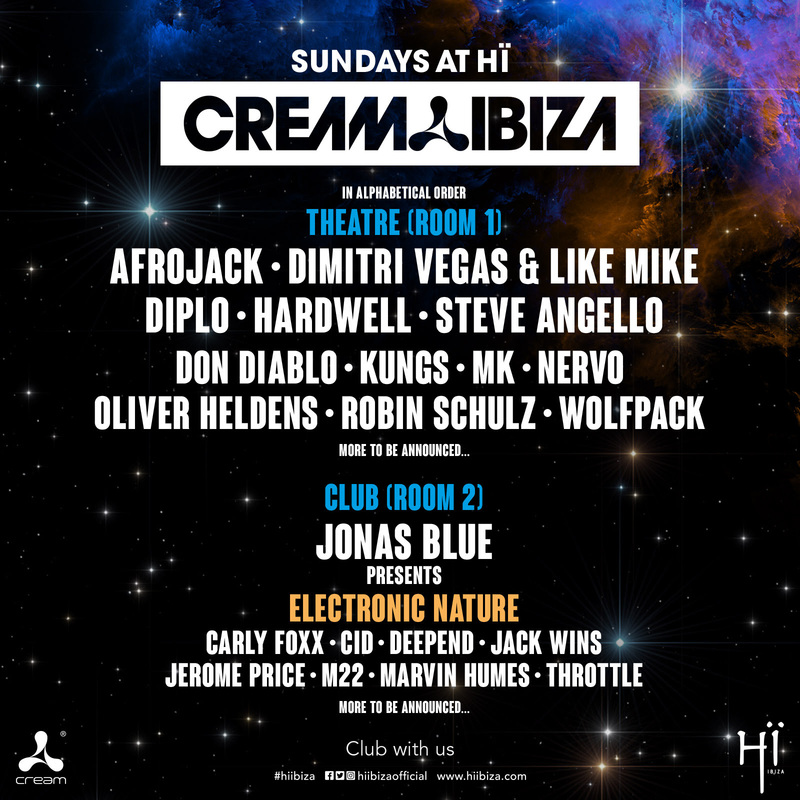 Cream Ibiza moves to its shiny new home at Hï Ibiza this summer and having already confirmed three electronic music heavyweights, namely Diplo, Hardwell and Steve Angello, as party regulars, the esteemed club brand can now reveal the next wave of big-name acts set to join them. Many of the world’s biggest DJs are confirmed to play each and every Sunday from 24th June – 23rd September including performances from Afrojack, Dimitri Vegas & Like Mike, Don Diablo, MK, NERVO and more in the Theatre, along with Jonas Blue hosting the Club room with his Electronic Nature concept each and every Sunday. Hï Ibiza’s Theatre will play host to regular chart topper and big room legend Afrojack, along with Dimitri Vegas and Like Mike, two acts that never fail to serve up explosive sets with plenty of huge vocals and crowd participation. House hero MK also stars. A prolific producer, as well as working alongside chart-topping acts like Rihanna and Jay Z, he’s produced some of house music’s most recognisable grooves. Dynamic Dutchman Don Diablo also joins the bill, along with French selector Kungs and effervescent Australian twins NERVO. They’ll be joined by two artists that are no stranger to the Theatre, Dutch DJ / Producer du jour Oliver Heldens and German producer Robin Schulz. Rounding out the first wave of acts for the Theatre, it’s a Hï Ibiza debut for Belgian duo Wolfpack who continue to go from strength-to-strength as they maintain their meteoric rise to the top. Meanwhile, taking things in a slightly different direction over in the Club is British hit-maker Jonas Blue, who hosts Hï Ibiza’s second room throughout the season with his Electronic Nature concept. He’ll be joined every week by a hand-picked selection of special guests set to bring forward-thinking tech-house sounds to the Club and delivering an alternative musical flavour to the Theatre, including Love Story Recordings label head Carly Foxx, Grammy award-winning American DJ CID, Deepend, Dutch DJ-Producer Jack Wins, House jock Jerome Price, M22, Capital FM selector Marvin Humes and Throttle,with lots more acts still to be announced.